The 1960’s and 1970’s brought with them great changes in modern life, and none more so in Catholic Nationalist areas of Northern Ireland. One such incident still lives with us today and will forever be a reminder of the bad times the Provence lived through. 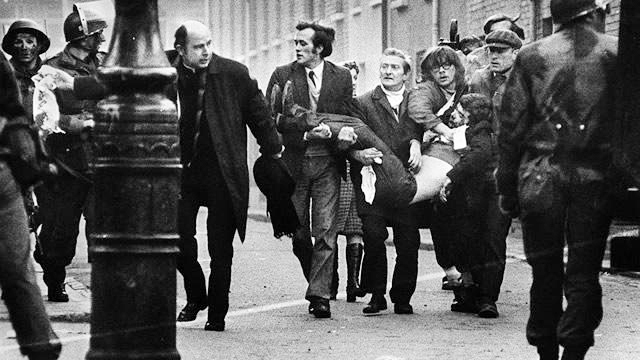 This day became known as Bloody Sunday. The incident, live ammunition fire on Protestors. As protestors ran from an army line, shots rang out, hitting a Mr. Jack Ruddy, who was the first casualty of the day. The man standing beside Mr. Ruddy, Father Daly gave him his last rites. The then Priest in the picture, Father Edward Daly, became a symbol of determination in the face of adversity due to a series of photographs taken by photojournalist Fulvio Grimaldi, as he tried to get Mr. Ruddy to a safe place.